Every business traveller is different but there are some things that all travellers will expect to be in their room, no matter where they are in the world. So, what do travellers rate as hotel room essentials? When you think about all the items a business traveller needs to charge, you’ll agree that a lot of hotels don’t have enough sockets to cater for all devices. From laptops and mobile phones to tablets and iPods, the list is endless. Ideally, there should be at least one power socket on each side of the bed, allowing you to charge while you sleep. This is especially important for those who use their mobile as an alarm clock. If the hotel room comes with a study desk or dressing table, it is important to have power sockets placed there too, for laptop charges and hair dryers/straighteners. Fast, secure Wi-Fi is a must: this really is a pretty obvious expectation for the business traveller. 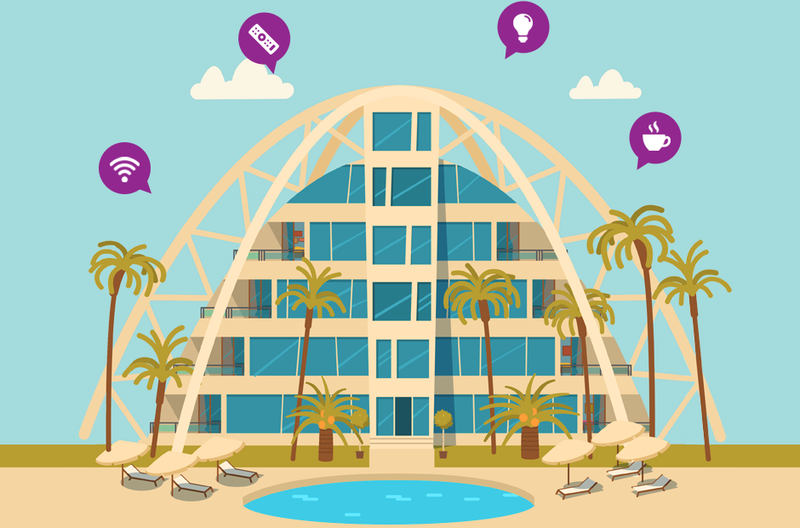 Connectivity has become such a necessary business need, so hotels should always offer it as standard, as business travellers need to be constantly reachable and be able to run their business on the go. Free internet is obviously the best option, with a straightforward login screen that makes it is as easy as possible to get online and doesn’t throw you off every hour. When you are travelling for work, extra TV inputs are a bonus. Business travellers need downtime too, so being able to plug in an iPad and watch downloaded films, use a phone to listen to music or set up a laptop to preview a presentation is a great addition to any hotel room. Other entertainment systems, such as a phone dock, mean that not only you can charge your device without needing an extra socket, but you can play some background music or use your phone as an alarm clock. A hotel lighting system should feature a good range of lamps and main lights, which you can adjust depending on the circumstances. Desk lights are also essential if you’re planning on working in the room, so you won't strain your eyes as you stare at your computer screen. Multiple lighting controls are also important. Having to navigate to the front door to find the one light switch in the entire room to go to the toilet in the middle of the night would be a total nightmare! Hotel electrical supplies such as a decent hair dryers, a good iron to help freshen up business clothing and a trouser press or equivalent are essential. So many hotels have inefficient heating or air conditioning systems which are also extremely noisy. Depending on where you are in the world, you’ll want to ensure the room is at a comfortable temperature of around 18 degrees. A decent sized, wall-mounted TV is a given, to catch up with the news headlines or unwind with some relaxing TV programmes. If you’re charging expenses to your room, most business travellers prefer to have a running total account which is accessible via the TV screen, especially if you want to avoid queues at the front desk in the morning. When you work away from home, generally you work longer hours so a mini-bar in the room can be a necessity too. Good quality hotel toiletries and fluffy white towels! A good selection of coffee, different teas and even hot chocolate is always welcome because, once you've finally switched off for the day, a hot tea or cocoa in bed will set you up for a great night's sleep and a productive day ahead.